Road Policing Officers carried out patrols and checks on the main roads of Fife, Midlothian and the Scottish Borders yesterday, Wednesday 11th May, stopping over 150 vehicles, including Large Goods Vehicles for safety checks. Officers from the Trunk Roads Patrol Group, supported by colleagues in Stirling, Fife and the Borders Divisional Road Policing Units patrolled main roads including the A977, A985 and the A68. Two goods vehicles were found to be dangerously overweight and were prohibited from continuing their journey, whilst two further goods vehicles were prohibited due to defective brakes. Two endorsable fixed penalty notices were issued to motorists travelling at excessive speeds and two were issued to drivers for using their mobile phones whilst driving. Three vehicles were seized for having no insurance. A 53-year-old man was charged with careless driving for tailgating and a 35-year-old female was reported for careless driving for colliding with a cyclist on a roundabout. The cyclist sustained minor injuries. Meanwhile, six people received warnings and corrective guidance for breaking the speed limit while 23 others were warned for miscellaneous offences including minor vehicle defects. In addition, 27 vehicle defect reports were detected and three vehicles seized for various motoring offences, including a 66-year-old man driving as a provisional licence holder unsupervised. Assisting with the activity in the Borders was the Driver and Vehicle Licensing Agency. Inspector Roddy MacMillan, Trunk Roads Inspector for the East of Scotland said: “It’s disappointing to report that a number of drivers were caught exceeding the speed limit and using mobile phones while driving and others driving vehicles with serious defects. “Their actions demonstrate a total disregard for the safety of themselves and other road users and the consequences can be disastrous. “I would urge people to slow down, use their observations and concentrate on the road ahead. As drivers, we have a responsibility to ensure that our vehicles are roadworthy. Please take the time to check your vehicles lights, tyres and brakes prior to commencing your journey. “Road Policing Officers from Forth Valley, Fife, Midlothian and the Scottish Borders have been concentrating on the objectives of Operation Alternate. This is an ongoing initiative throughout the year and my officers will be focussing on the detection of road crime and offences. 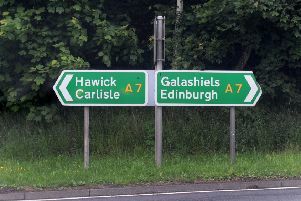 “The intention of this campaign is to influence road user behaviour and make Scotland’s roads safer, by promoting safe and responsible driving throughout the trunk roads network in Scotland, raising awareness and reducing the number of casualties from road collisions. “Ultimately we want to reduce road crime and disrupt criminals on our roads.